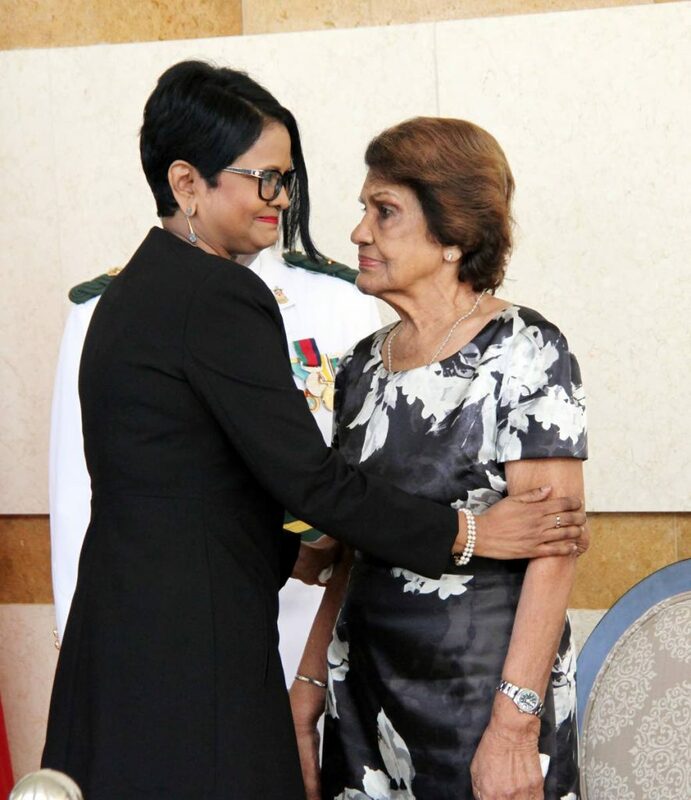 At one point in time, as she stood near the casket bearing the remains of her husband and former president George Maxwell Richards, Dr Jean Ramjohn-Richards just could not keep her emotions in check, wiping away tears as she graciously accepted words of condolences yesterday from those filing past her husband’s coffin. The body of Richards, 86, who died last Monday lay in state at Parliament in the Port of Spain International Waterfront Centre. 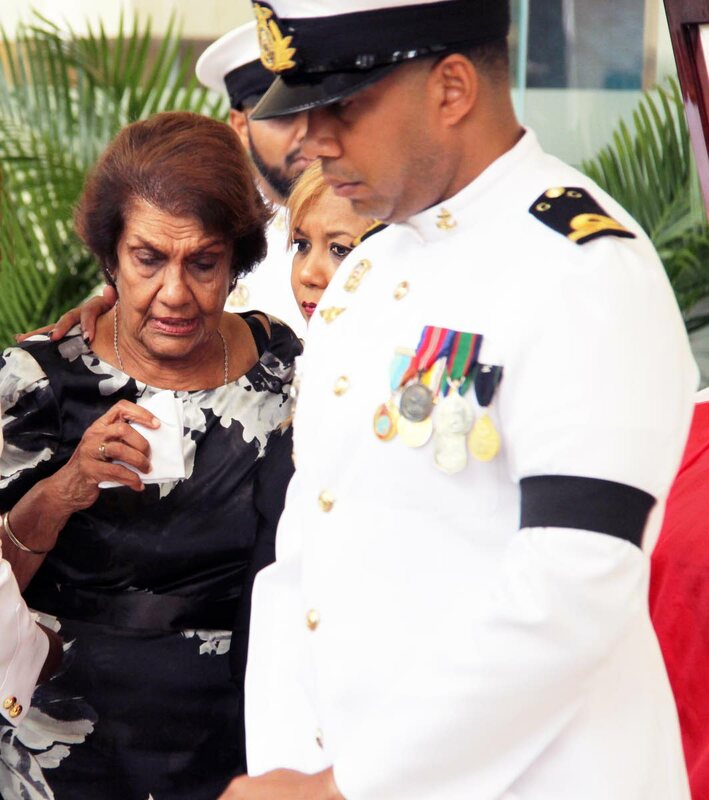 At 11.28 am, after several parliamentarians and diplomats paid their respects, Ramjohn-Richards and her daughter Maxine walked over to his open casket to spend some private moments with him. Maxwell Richards to the lobby of the Parliament where it laid in state yesterday. Maxine comforted her mother who dabbed her eyes with a white handkerchief. The two briefly left the area where the casket was placed, as preparations were made to allow members of the public to view Richards’ body. At 11.40 am, Speaker of the House Bridgid Annisette-George and Deputy Speaker Esmond Forde escorted Ramjohn-Richards out of Tower D to a waiting car. Maxine and her sister in law Dr Maryam Abdul Richards greeted members of the public who filed past Richards’ casket and signed the condolence book. Abdul Richards appreciated the public sympathy for Richards. Acting President Christine Kangaloo consoles Dr Jean Ramjohn-Richards yesterday. From 10 am, Ramjohn-Richards and Maxine greeted several dignitaries who came to pay their respects to Richards. The first was Acting President Christine Kangaloo who is deputising for an absent Anthony Carmona. 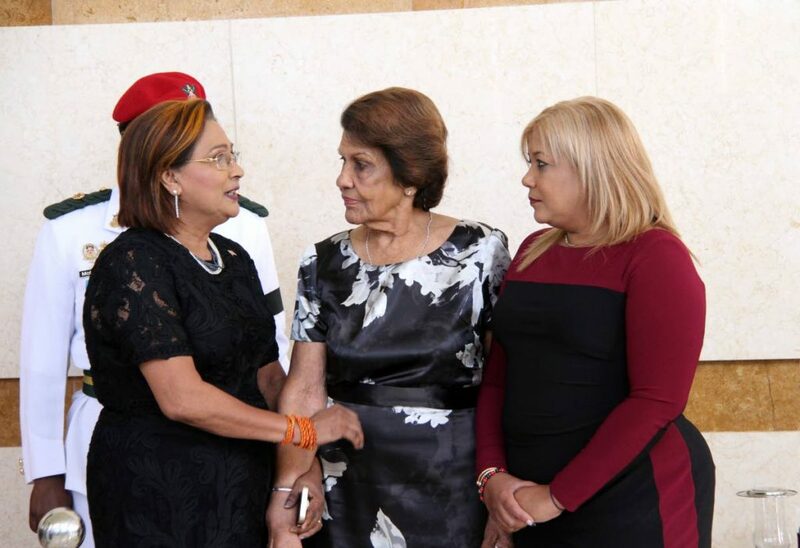 Yesterday, it was not known if Carmona who is said to be in the Hague in the Netherlands, would return home in time for Richards’ funeral tomorrow. At 10.05 am, Prime Minister Dr Keith Rowley viewed Richards’ body before extending condolences to Ramjohn-Richards and Maxine, who sat close to the open casket. It was obvious that as Rowley spoke to her, Ramjohn-Richards struggled to maintain her composure. Chief Justice Ivor Archie arrived soon after. Neither men spoke with reporters. 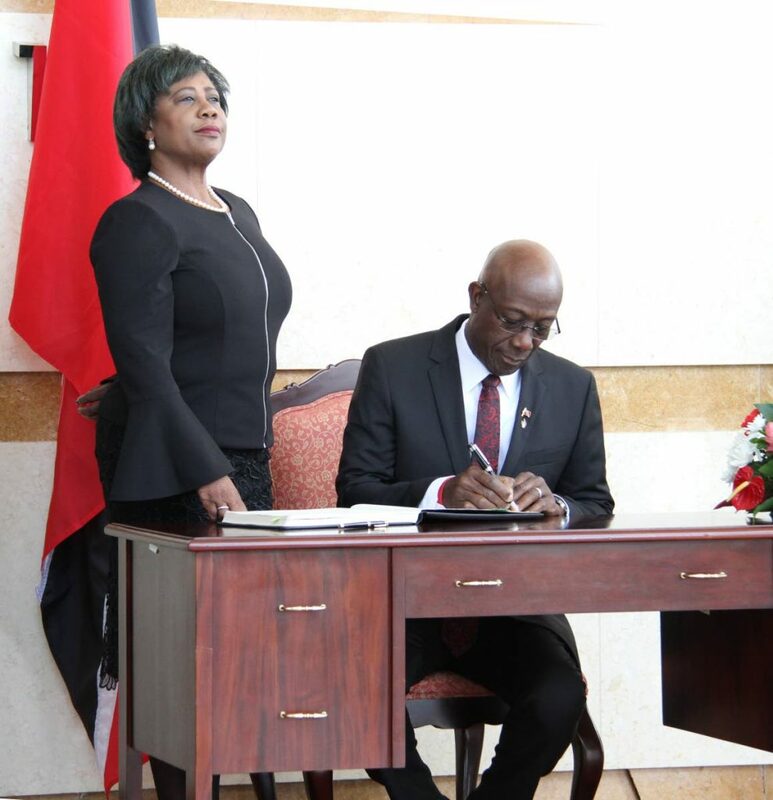 CONDOLENCES: Flanked by House Speaker Bridgid Annisette-George, Prime Minister Dr Keith Rowley signs the condolence book opened at the Parliament in honour of Richards. lobby where his body laid in state. 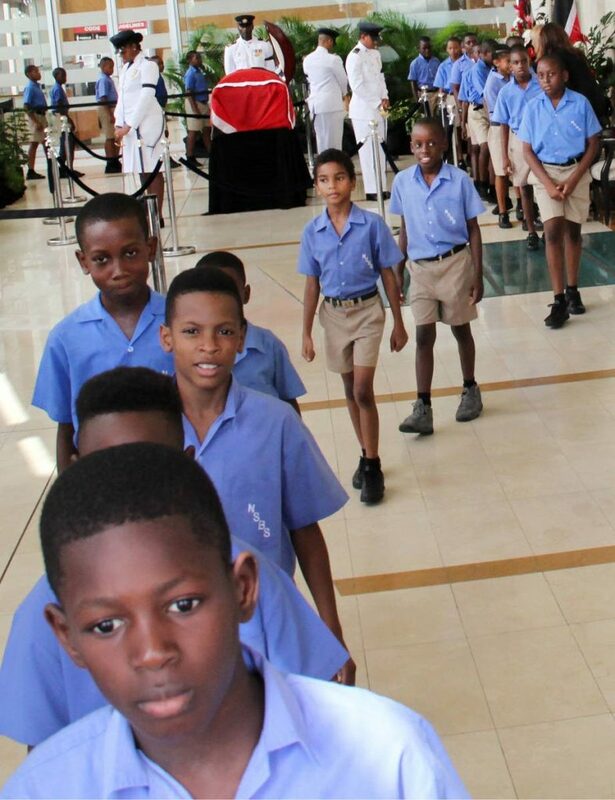 Among the foreign diplomats who joined the queue early to pay tribute were Cuban Ambassador Guillermo Vázquez Moreno, Guyana’s High Commissioner Bishwaishwar “Cammie” Ramsaroop-Maraj and Pan American Health Organisation country representative Bernadette Theodore-Gandi. 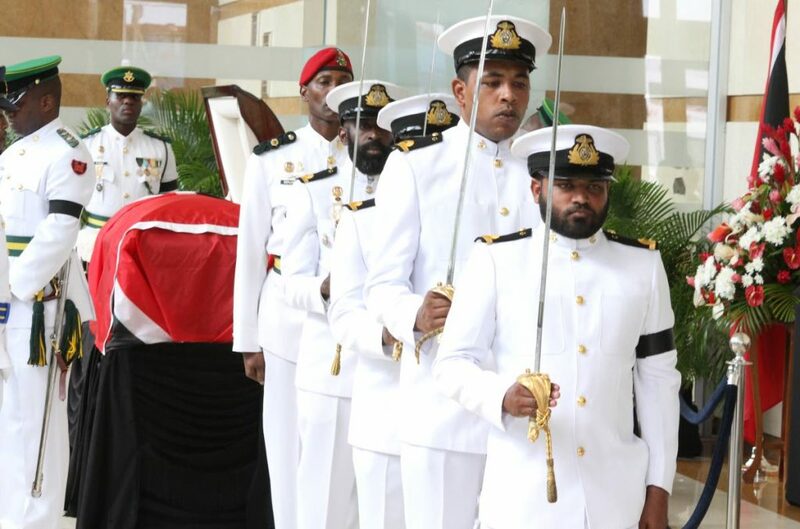 Members of the Defence Force, their ceremonial swords drawn, form an honour guard yesterday near the casket bearing the remains of former president George Maxwell Richards at the Parliament lobby. Hubert Peter Diaz, the flag bearer of TT, remembered being with Richards in the TT contingent that travelled to Germany to see this country’s Soca Warriors play in the 2006 World Cup. “We stayed in the same hotel and had breakfast at the same table. He was a real gentleman and loved people very much,” Diaz said. Elizabeth Pope of Morvant said, “I’m feeling sad but I’m glad I came and glad I saw him. I’m blessed.” Arielle Critchlow, “ I’m very saddened by the passing of our former president. He was a great individual, and leaves behind a great legacy.” People believed what Richards has done for TT will live on forever. 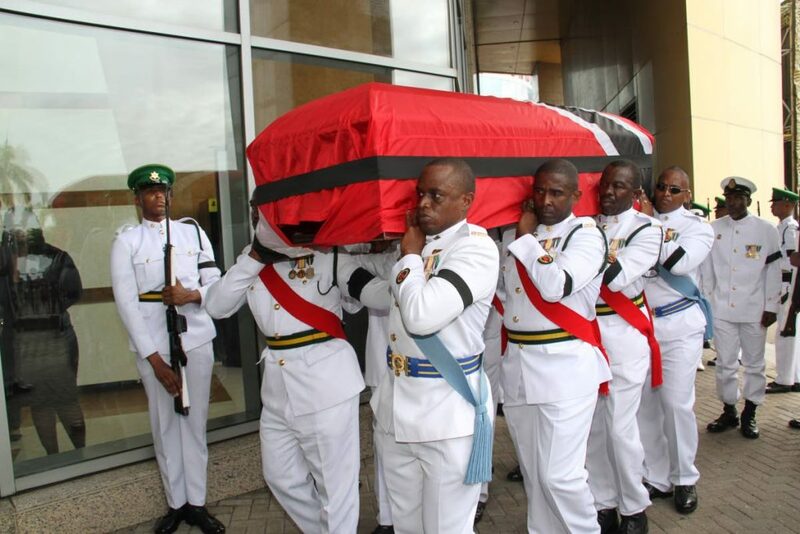 Earlier in the day, members of the Defence Force escorted the casket draped in the national flag on a carriage through the streets of downtown Port of Spain, en route to the Parliament. The body arrived at the Parliament at 9.30 am ahead of a procession of soldiers dressed in white ceremonial tunics and to the rhythm of a marching band. Annisette-George and her delegation received the body where it was placed to lie in state. A handful of people who were on Abercromby Street at the start of the procession, during the cool morning, were seen taking photos and videos on their cell phones. Reply to "TEARS FOR MAX"